Bruce Rauner was sworn in as the 42nd governor of Illinois on Monday in Springfield. SPRINGFIELD, Ill. (WLS) -- Bruce Rauner was sworn in as the 42nd governor of Illinois on Monday in Springfield. The Winnetka businessman ousted Democrat Pat Quinn in November to become the first Republican to take the governor's mansion since 2003, when George Ryan left. Rauner was sworn in after a morning prayer service that included Archbishop Blase Cupich and the Rev. James Meeks, both of Chicago, as well as Muslim and Jewish leaders. When asked to raise his right hand and place the left one on the Bible, Rauner got a little mixed up and did the opposite. The swearing-in went on, Rauner's team saying nothing in the Illinois Constitution dictates which hand should be placed where, and afterward he thanked his wife and family and expressed his gratitude to veterans. "It is an honor to stand before you, before ALL the people of Illinois, today. I am humbled. I am honored. I am privileged. I am excited," Gov. Rauner said. Text of Governor Bruce Rauner Inaugural Speech, as prepared for delivery, on January 12, 2015. Republican Lt. Gov. 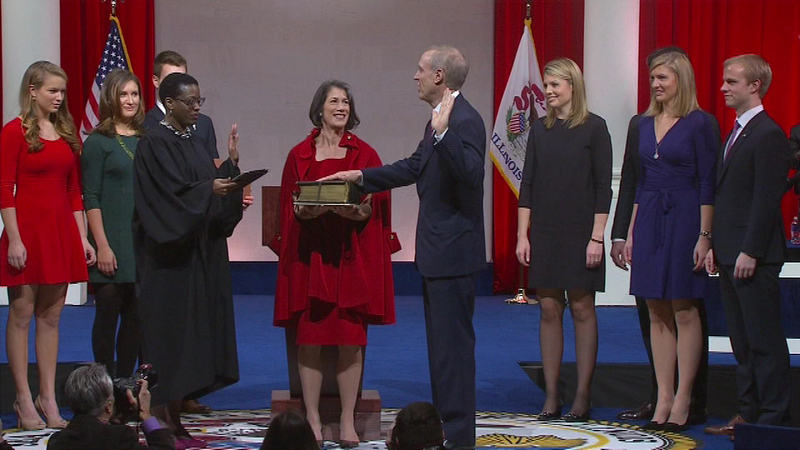 Evelyn Sanguinetti, Democratic Attorney General Lisa Madigan and Secretary of State Jesse White were also sworn into office, as were Republican Comptroller Leslie Munger, appointed after the death of Judy Baar Topinka, and Democratic Treasurer Michael Frerichs. A moment of silence was held for Topinka, who was elected to a second term as comptroller but died suddenly in December. Quinn tweeted his farewell on Monday morning around 11 a.m. "Thank you all. I look forward to continuing our work to make the will of the people the law of the land." Rauner is faced with many fiscal challenges: the state has a multibillion-dollar budget deficit, billions in unpaid bills, the worst credit rating of any state and a $111 billion public-pension shortfall. "We have an opportunity to accomplish something historic: to fix years of busted budgets and broken government; to forge a path toward long-term prosperity and a brighter future; to make Illinois the kind of state others aspire to become, a national leader in job growth and education quality," Rauner said. To do that will require sacrifice, he said. "Sacrifice by all of us - politicians and interests groups, business and labor, those who pay for government and those who depend on government's services," he said. Rauner's first action as governor was to freeze non-essential spending in all state agencies. "Taxpayers' money belongs to them; not the government. We have a moral obligation to minimize how much we take and to ensure what we do take is spent efficiently and effectively," Rauner said. "Every dollar we spend unnecessarily inside government is a dollar we can't put into classrooms or social service providers, or leave in the pockets of entrepreneurs and homeowners." Rauner did not give specifics of what he will do to resolve the state's financial crisis. "I'm sure the governor believe everything he said, but he hasn't really been following some of the progress we've made in the state in the last six years," Sen. John Cullerton, Democrat, said. "When he lays out his budget plan in about a month I think we will see more detail," Senator Sue Rezin, (R) Grundy County, said. Rauner will make that budget address on February 18. Also on Monday, the governor repeated his pledge to reduce his salary to $1 and decline all benefits. He promised bipartisanship and said "business as usual" in Illinois is over. "To the people of Illinois, and the people outside our state who have been reluctant to invest in Illinois because of the insider deals and cronyism, I say this: I'm nobody that nobody sent," Rauner said. Illinois House Speaker Michael Madigan, a Democrat, had no comment when asked if he had any advice for incoming governor. "Read what you want into it, but historically the Speaker has worked much better with Republican governors and Democratic governors," Illinois House Minority Leader Jim Durkin (R) said. Chicago Mayor Rahm Emanuel, a democrat, and Rauner have been friends for years. Emanuel was at Monday's inauguration. The mayor said he expects the new governor will not interfere with Chicago's move to raise the minimum wage. "Our friendship doesn't mean we won't disagree, but we won't make it personal when we disagree," he said. "There are entrenched interests but all those special interests will be making a mistake if they don't heed the advice of the electorate." "Speaker Madigan respects hard work. He didn't think Blagojevich worked hard enough and with Governor Quinn, I don't know what the issue was, probably he thought he wasn't as organized as he should be," RTA Chairman Kirk Dillard, a former state senator who lost his bid for governor, said. "There's a lot of days I'm very relieved it's Governor Rauner, not me." A bi-partisan band starring two Republican state reps and a Democratic state senator performed Monday night. They call themselves "The Boat Drink Caucus!" Country singer Tobey Keith was scheduled to perform Monday night, followed by Bruce and Diana Rauner's first dance as Governor and First Lady of Illinois. Rauner hosted a post-inauguration meet and greet at the Old State Capitol in Springfield. He and his wife, Diana, thanked supporters and introduced themselves to their new neighbors. On Sunday, hundreds attended Rauner's $1,000 a plate inaugural dinner. Earlier in Sunday, Rauner stopped by the Lincoln Presidential Museum with his family. Diana Rauner read "Mr. Lincoln's Whiskers," by Karen Winnick, which tells the true story of an 11-year-old who wrote to Lincoln when he was a presidential candidate in 1860 and encouraged him to grow his iconic beard. Diana Rauner asked her husband to read Lincoln's response, but he begged off, despite his wife's promise to "hold it way back." Rauner laughed when a reporter asked if he had ever grown a beard. "My beards are very scruffy," the former college football player said. "They look bad. I've had many, but not like Lincoln's."